Email has been a boon to entrepreneurs, startup founders, and marketers over the past few years. It has allowed them to do cold outreach, run business operations and market their products and services at almost no price at all. In fact, email has shown astronomical results as a marketing medium. It is one of the most popular, if not the most, marketing channels followed by both small businesses and huge companies alike. 1. The total number of email accounts is expected to increase to over 3.7 billion by the end of 2017. Despite the talk about the death of email, email seems to be becoming only more ubiquitous. The problem with email, anyway, has more to do with management, and not usability. This statistic shows us that email is not going anywhere anytime soon and that marketers should continue to keep focusing on their email marketing campaigns for the foreseeable future. While there is an increase in the number other forms of communication available for entrepreneurs and marketers, such as IM, social media etc., email continues to be the most popular medium where the lion's share of businesses communication happens. Its immediacy, simplicity, ubiquity, and no-cost service has made it an integral part of our everyday lives and businesses alike. Also, a person’s email id is like the social security number of the online world - websites and companies recognize you by your email. In fact, to perform most of the online transactions you need an email account. Use Gmail for business? Hiver's Shared Inbox will let you delegate emails as tasks in seconds, communicate seamlessly with your team without having to email them, and much more. 2. On an average, consumers have about 1.86 email accounts per person. Most people have multiple accounts for different purposes, one for business, one for shopping, one for personal etc. This is good news for businesses in a way. The existence of more than one touch point per customer improves your odds. If a customer misses your email on one account, there is a chance they will find you on their other account (obviously, given that you have both the email Ids). Whereas in social media multiple touch-points in the same channel is practically non-existent; email gives you that option. The number of accounts per person is, in fact, projected to keep increasing in the future. 3. One of the most important metrics for measuring the success of email marketing - it’s ROI, is a staggering 4300% in this year. This implies that for every dollar you spend on email marketing, you can expect a return on your investment of about $44. Also, the monetary costs for email marketing are quite negligible; the biggest investment you will be making is the time you spend on writing the content and designing the campaigns. 4. The proportion of companies who can send emails based on individual activities and preferences has almost doubled from 8% to 15%. Email marketing, for the most part, is a very cost-effective means, but to be able to produce personalized emails and track the performance of a campaign, it is important to collect relevant data. You need data to be able to understand the basics of email marketing, for example, at what time do most people check emails. The dependence on data to take important strategic decisions will only grow in the future. More and more bigger companies and email-focused websites are investing in data research to understand the art of email marketing better; often the information, research, and insights drawn from these researches or studies are available on the internet for everyone to see. This is great news for smaller businesses who cannot invest money in data research by themselves. They have access to important information that will allow them to market better without having to spend good money for it. 5. 55% of all emails are opened on mobile devices. This is great news for the smartphone age businesses. This means that email is one of the easiest ways to enter the mobile space of your prospects. While calling them or using instant messages can seem intrusive, email is a smart way to politely appeal to the smartphone-dependent generation. One thing to keep in mind is that your emails should be mobile optimized both for presentation and readability. Another important fact to know here is that 79% of all mobile email opens happen on an Apple device. So if you have to prioritize, then put mobile optimization for Apple devices first. 6. B2B email campaigns reported a 66% higher click-through rate than B2C in 2017. Although this statistic doesn’t necessarily mean that B2B marketers are better than B2C marketers, it could possibly mean that B2B marketers are more aware of who their target audience is and probably have a much more segmented approach in their campaigns. 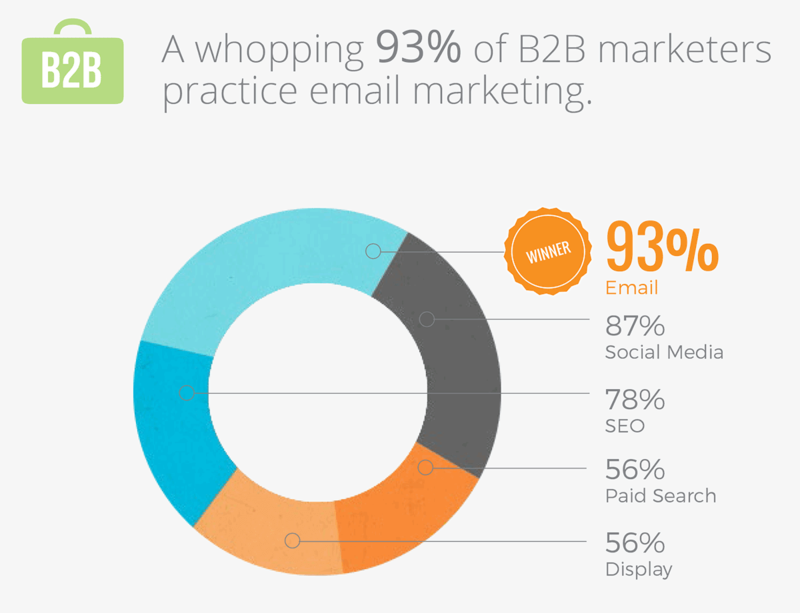 At any rate, email seems to be working relatively well for B2B than for B2C. So, if you are a B2B company, you must most certainly prioritize email marketing and spend the majority of your marketing efforts on it; if you are B2C company then email may or may not be as effective for you. 7. Currently, 67% of the marketing leaders automate their campaigns in some way or the other. Not only does automation help save time and allow you to be consistent with your marketing, it can also help you track your metrics and test your campaign ideas. It gives you an opportunity to listen to the pulse of your audience. Depending on the results, you get to adjust your campaign. For example, you can try a couple of different subject lines and see which one works the best. In fact, you can A/B test every aspect and detail of your campaign and maximize the results and the ROI. There are several tools out there, which can help you make the most of automation without losing the human touch. 8. Most consumers check their email and text messages first thing in the morning, before anything else. For an email to accomplish its purpose, timing is an important factor. If you schedule your email in such a way that it gets delivered at around 7.30 AM, for example, the email will be fresh in the reader’s inbox, as opposed to sending it during busy work timings when it is easy to get completely ignored. Especially mobile email open rates were found to be highest during non-working hours; People like to check their emails on the go and during breaks. Targeting these timings would certainly be a smart move. Hiver's Send Later helps you schedule emails with just a few clicks! 9. 73% of the millennials prefer email for business communication because it is a ‘part of the everyday life’. It is a very common misconception that millennials hate email when that is not the case at all. In fact, 70% of the millennials check their email from the bed. While they may seem to favor social media and instant messaging when communicating with friends, when communicating with brands email is still the most preferred medium. Most of them don’t see social media as a place for brands and promotions. They see social media as a private and personal space; they don’t open Facebook to see what new models your furniture store has! So when prioritizing your marketing channels, placing email first is the best thing to do. In fact, email is 40 times more effective for acquiring new customers than social media giants like Facebook and Twitter. 10. Half of the email users check their emails when bored, so your email must eliminate their boredom. Not only do your emails have to serve some purpose and add value to the readers, but they must also be engaging and entertaining in some way. A well-written witty email content is one way, visually appealing emails is another example. People check emails randomly throughout the day without any purpose or point. When your email is good enough to catch their attention, they will stop to look again. On the contrary, if your email is text-heavy and looks boring, it probably will go straight to the trash. To summarize the key takeaways, email marketing should be high on your priority list and you must definitely make sure that your emails are mobile optimized. A subject line is one of the major deciding factors of your open rate and personalized content will give better results. Overall, contemplate on every detail of your email marketing campaign and don’t leave anything to chance. Manogna is a content marketer at Hiver. She has always been passionate about writing and marketing, and finally decided to go for it.